In Part I and Part II, we have been concerned with the simpler things that make individual concealment possible. We have stressed the basic points of background and silhouette and shadow. You will find yourself in numerous positions not covered specifically in this book, but if you remember the principles we have covered, you can meet every situation successfully. Fintech LTD is newest software in the market which is a made for next-generation financial technology which has been developed for purpose of making trades online and this system works on auto-pilot mode which was created by Daniel Roberts and his team members and this software can be used by both novices and professionals. One rule must be before you at all times. Don’t relax, as long as there is a chance of your being observed. Practice concealment every moment of your life as a soldier. It will be a longer life and a safer one, and there will be more dead enemy soldiers behind you. Foxholes are the individual soldier’s own fortified position. Such a position deserves every bit of attention to concealment you can give it. You are going to live in it for a time—a time during which it will be your main protection in a battlefield. Do everything you can to make it inconspicuous. As always, after the demands of the military situation, background is the first consideration. Choose a place within the assigned area where the foxhole will not change the look of the terrain. Natural concealment is best. Keep both ground and aerial observation in mind. 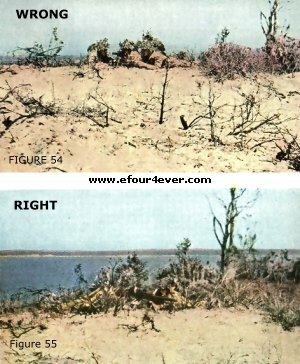 Against ground observation, site your foxhole so that you are not silhouetted against the sky or against a background of a contrasting color (fig. 46). Against air observation, site your foxhole under trees or bushes or in a dark area of the terrain. Make sure that your bush or tree is not isolated. A lone clump of vegetation is a conspicuous hiding place and will draw enemy fire whether he can see you or not. From the air, or from higher ground, spoil around a foxhole betrays the position. Dispose of your spoil from the foxhole. Carry it away in sandbags or shelter halves, if you have time. Dispose of it under low. bushes, or dump it on dirt roads or paths, or in streams or ponds. This foxhole is concealed from the vertical air view by overhanging branches from a nearby tree. If time or circumstances make it possible to dispose of spoil, cover it with natural materials. Soldiers have covered the spoil around their two-man foxhole with pine needles. A foxhole is sited under trees is concealed from both air and ground views. Lines are always important in any terrain. Trenches sited along natural ground lines such as edges of fields, intersections of hedgerows, fences, and cultivation patterns are difficult to distinguish. Covers for foxholes can be made to simulate tall grass (fig. 49), bushes, and rocks, whichever the terrain calls for. They are valuable principally against aerial observation. They are light in weight and may be easily pushed out of the way. The foundation of a foxhole cover is a frame (fig. 51) either flat or rounded—shaped from short branches bound together with wire, twine, strips of cloth, strips of woven reeds or dried grass. This frame may be garnished with grass or natural foliage to match the surroundings. Natural garnishing materials must be replaced before they wilt and change color. If this is not done the position will be in contrast to its background. Slits are left for firing. The machine gun is the vital weapon in both attack and defense. It receives the closest attention of enemy troops and its concealment must be as perfect as possible. It engages troops at comparatively close range, it fires frequently, and the enemy will continuously try to find and destroy the gun. Usually, machine-gun positions are hasty, in which case camouflage means sighting to best advantage and then using natural materials at hand. 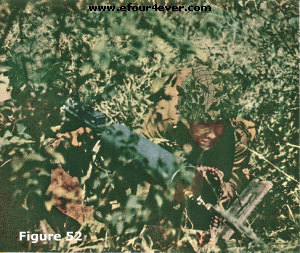 The Figure 52 photograph shows a machine gun well sited among natural materials. In the following pages are some of the methods used to camouflage machine guns. As before in this book, the essential factors are background and silhouette. No position can be regarded as completely concealed, however, unless shine, spoil, and tracks have been eliminated. In Figure 54, the crew has forgotten its background; the gun and gunners are silhouetted. Below in Figure 55, the crew has taken proper action to distort their silhouette, to blend the outline of the gun and its crew with the background. Foliage common to the area is used, and is placed in its natural position. Debris offers excellent positions for machine guns. The confused area makes it difficult to pick up the silhouette of a gun and its crew, especially if the position has been chosen with a good background. 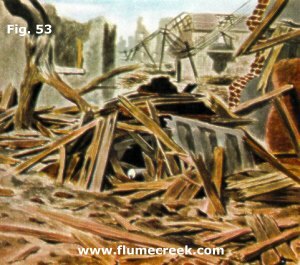 Figure 53 shows a well-sited, well-concealed position in debris. Several factors must be taken into account in such an area, however. When the gun is fired, dust may be kicked up and betray the position to the enemy. If possible, take care to eliminate such a possibility by wetting it down is effective camouflage, but it should be sturdy enough to resist shock and fire. Otherwise it may collapse upon the position. Also, an isolated patch of debris in a street is conspicuous. It is an obvious place for concealment and is sure to draw enemy fire whether he sees a gun in the position or not. Stay away from isolated positions of concealment. Always have an alternate concealed position chosen in case you are required to move. The best position in the terrain is not good enough and natural materials are insufficient for concealment, artificial materials are used. A simple, quickly erected camouflage device is the drape, made of shrimp net or of garnished twine net. Propped over the machine gun to distort its shape, it is erected near natural vegetation of some sort, with which it is “tied in and blended. At close range the nature of the camouflaged object is concealed, and from a distance the drape itself melts into the surroundings. Figure 56 illustrates a quickly prepared surface emplacement. The drape is thrown over the gun and blended with surrounding vegetation. This takes only a few seconds, but it does an effective job. The front of the drape has been lifted for firing the piece. The flat-top is an answer to the problem of concealing dug-in machine-gun positions. The simple flat-top illustrated above requires no framework. Its materials are four posts about 2 feet long, some No. 10 wire and a garnished 15- by 15-foot twine net. Corner posts are not driven; they rest on the ground and are held in place by double strands of No. 10 wire, tightened by racking. When wire is not available for guys, tent-guy ropes will do the trick. Corners of the net are slipped over the posts before racking. To dismantle the flat-top, the corner posts are knocked out and the net collapses. The figure below shows the completed job, with natural foliage used to break up the shadow of the gun embrasure. Figure 57 and 58 show the detail of the flat-top machine-gun drape. Note the garnishing is thinned out at the edges. The whole structure is as low to the ground as possible. Figure 57 shows the corner posts and the manner in which they are guyed to the ground. This small flat-top may be made out of improvised materials as well. Figure 58is the flat-top garnished with natural materials — tall grass from the surrounding area. This is especially effective in areas where wilted and dried vegetation form the background. If background is formed of growing vegetation, the garnishing must be changed regularly to prevent wilted materials from revealing the installation. Such an improvised flat-top may be made, in the absence of issue twine net, by using tent ropes or vines to form framework. For a deliberate position, especially in terrain with natural foliage, the folding buggy-top (see Figure 61) conceals the machine gun which has an antiaircraft or all-around fire mission. It can be folded back quickly, allowing the gunners to engage aerial targets (see Figure 62). When it is folded back, the whole structure lies flat on the ground. Construction details are shown in Figure 63. The frame can be made of pipe, saplings, or lumber. Hinges are made either of No. 10 wire, stakes pivoted on a pin made of wire or a drift pin, pieces of scrap leather, or stock door hinges. The net is a 15-foot by 15-foot garnished twine net. Take care that the vegetation around the position is not compressed by the buggy-top when it is open. If the vegetation does become damaged, steps must be taken to restore its natural appearance. To complete camouflage small bushes must be placed irregularly around edges of net. In a deliberate position, the swinging flat-top (Figure 63) is a slightly more elaborate flat-top for anti-aircraft machine guns. It is a cantilever structure hinged on a post at one corner. It is easily pushed to one side, giving the gun an unobstructed view of the sky. It, too, uses the 15 by 15 foot garnished twine net. This flat-top pivots on a simply constructed hinge, as illustrated in figure 64. Although the cantilever construction demands a slight upward slope from hinge to outer edge, to equalize tension and pressure on the post, the whole structure should be as low to the ground as possible.